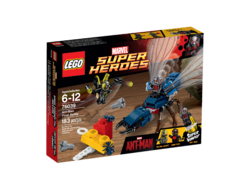 76039 Ant-Man Final Battle is a Marvel Super Heroes set released in 2015. The set comes with a brick-built flying ant and oversized LEGO bricks. This set is made as if Ant-Man, Hank Pym and Yellowjacket had used their suit's powers to shrink, so it is built to a scale much larger than most sets. It contains a flying ant for Ant-Man to ride, and brick-built enlarged LEGO bricks and screws. The set includes three minifigures- Ant-Man, Hank Pym and Yellowjacket. Australia: This set is available through the online LEGO Shop only. The original piece count for this set was 183, however early reviews found that the ant's legs would buckle very easily if any downward pressure was applied. The set was later updated to include two extra parts for each leg for better support. Regions where the boxes display piece counts on the front of the box still currently show 183 pieces even though the extra twelve parts are present inside. This is a description taken from LEGO.com. Please do not modify it. (visit this item's product page) Capture Yellowjacket in the flying ant’s pincers! Get set for a massive battle on a micro scale! Ride with Ant-Man on the giant flying ant, firing the flick missiles on each wing. Evade Yellowjacket’s stud shooters and LEGO® brick-built catapult. After landing, use Ant-Man’s special powers to communicate with the ants and activate the Super Jumper to knock over Yellowjacket. Take off again on the flying ant and swoop to capture Yellowjacket in its pincers! 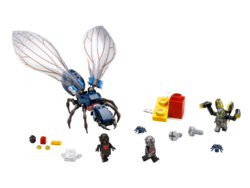 Includes 3 minifigures with weapon and accessory elements: Ant-Man, Hank Pym and Yellowjacket. Ant-Man riding the set's ant. Facts about "76039 Ant-Man Final Battle"
This page was last edited on 14 August 2016, at 03:23.